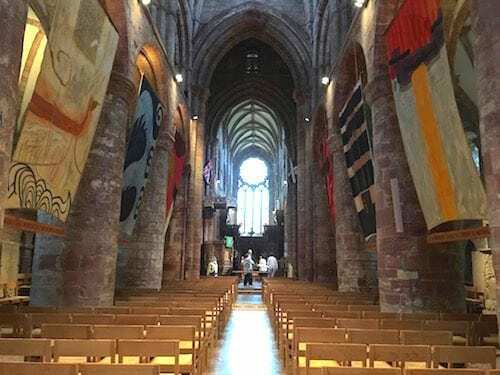 ABOARD THE VIKING SKY – What amazing stories must lie buried here, including one about the man for whom this magnificent cathedral was built and whose bones are said to be interred in one of the walls. When our ship docked in the Orkney Islands in Scotland, we headed to the ancient cities of Stromness and Kirkwall, the capital of Orkney. Founded in the early 11th century, the original part of Kirkwall is considered one of the best examples of an ancient Norse town. 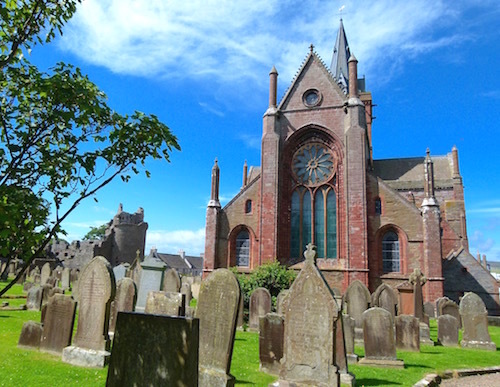 St. Magnus Cathedral is in the heart of the very walkable city of Kirkwall so, after an initial tour, we had time to explore on our own. The cathedral has a large historic cemetery where I could have spent hours reading the inscriptions on the gravestones. Next to the cathedral are the ruins of the former Bishop’s Palace and Earl’s Palace, hinting at the glories that once must have been here. The real story of St. Magnus Cathedral begins with a man named Magnus Eriendsson, Thelma said. In 1117, Magnus and his cousin Hakon were the joint Earls of Orkney. Magnus was a kind man who had already gained a reputation as a pious peacemaker. He was well known for refusing to carry arms during a raid on the Welsh some years earlier. But, when the two men agreed to meet on the island of Egilsay to resolve their differences peacefully, the inevitable happened. Although they had agreed to bring two ships of unarmed men, Hakon arrived with eight ships full of armed men. With his two ships of unarmed men, Magnus had no backup army and didn’t want to fight. Hakon didn’t feel the same way. Although Hakon didn’t want the blood of his cousin on his hands, he did want Magnus dead. He ordered his cook Lifolf to do the deed. Magnus died praying for his executioners. “He was killed by an ax blow to his head by the cook,” Thelma said. Magnus was buried in Birsay where stories began to spread about miracles happening at his grave. Before long, people began to believe that Magnus was a holy man. One of those “miracles” happened to the man who eventually did proclaim that Magnus a saint. 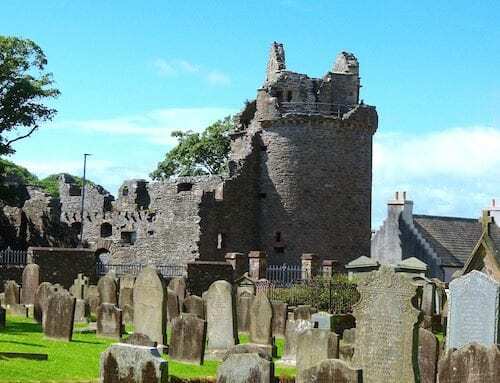 The tale goes that William the Old, the Bishop of Orkney, tried to dismiss the growing cult of Magnus who wanted the dead man proclaimed a saint. 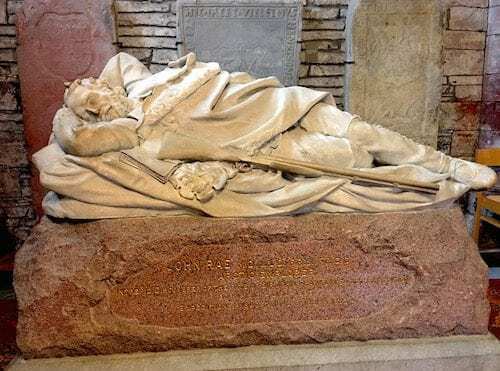 However, when the bishop suddenly lost his sight, he fell upon the grave of Magnus and began to pray. As quickly as it had disappeared, the bishop’s vision was restored. Whatever the reason, 21 years after his death, Magnus was proclaimed a saint by Bishop William. Meanwhile, Magnus’ nephew Rognvald came to claim his uncle’s earldom. Rognvald also promised the people of Orkney that he would build a great stone church to honor his uncle and to become a place of pilgrimage. That is exactly what he did. “The cathedral was founded in 1137,” Thelma said. Near continuous work followed for the next 875 years using red sandstone and yellow sandstone, all quarried from the islands. Centuries later, another strange occurrence happened. St. Magnus’ remains were said to have been enshrined in a column of the church but no one seemed to have proof that the story was true. When extensive restoration work was done on the cathedral in 1919, a box with bones was found behind stonework. The skull in the box had a wound consistent with the ax blow said to have killed St. Magnus.